US/UK, 2006, 127 minutes. Colour. Bryce Dallas Howard, Romola Garai, David Oyelowo, Adrian Lester, Richard Clifford, Brian Blessed, Patrick Doyle, Alfred Molina, Janet Mc Teer, Richard Briers. 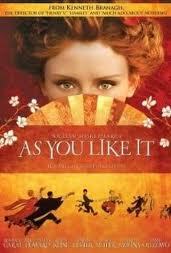 As You Like It is one of Shakespeare’s most popular romantic comedies. Writer-director Kenneth Branagh has adapted several of Shakespeare’s plays for the screen: Henry V, Much Ado About Nothing, Hamlet, the 30s musical version of Love’s Labour’s Lost. With As You Like It, he goes to Japan in the 19th century, one of the foreign enclaves along the coast of Japan, opening up to Japanese culture and custom as well as trade during the 19th century. The film has its Forest of Arden. However, it also has a Japanese court, Japanese singing, customs and manners, food and drink, sumo wrestling. This seems to work for most audiences – and the film looks very beautiful indeed. Branagh has pruned the play for screen purposes. This means that the audience can focus on the characters and the plot and enjoy much of Shakespeare’s text, especially Jaques’ famous ‘All the world’s a stage’ speech. Branagh relies on some of his regular team for the play, especially Richard Briers as Old Adam and Patrick Doyle, his regular composer, who also appears on screen, singing the songs. Adrian Lester is Oliver, the villain who changes heart. Brian Blessed appears in the dual role as the duke and his brother. American Bryce Dallas Howard is very strong in the central role of Rosalind. She is supported by Romola Garai as Celia. David Oyelowo is the hero, Orlando, a sumo wrestler who clashes with his brother, goes out into the Forest of Arden and pines for Rosalind. The comic touches are provided by Alfred Molina as Touchstone and Janet Mc Teer as Audrey whom he wants to marry. The film emphasises the dark side of the play, especially the political unrest and the palace coup. There is a melancholy tone, emphasised by the character of Jacques, and his various speeches, including ‘All the world’s a stage’. He is played effectively by Kevin Kline (his speech starting with a long shot and the camera quietly tracking around the forest and finishing with a close-up of Kline’s face. This film may not please the purists – which most film versions do not. However, for somebody wanting an introduction to Shakespeare or to As You Like It, this is a good way of encountering the play. 1. Shakespeare’s play? Quality? Reputation? Audiences familiar with the play or not? 2. Kenneth Branagh and his career, imagining performances of Shakespeare, different settings? 3. The editing of the text for the screen? Keeping the focus on the characters, the plot developments, Shakespeare’s language? 4. The information about the Japanese enclave, appropriate for As You Like It? The rich and beautiful visuals? The court and the forests, costumes, décor, banners and Japanese lettering, the dances, song, the sumo wrestling, the warrior attack? The cumulative effect for a Shakespearean play? 5. The songs, the score, Patrick Doyle as Amiens, the moods at the court, the moods in the forest, the variety of songs, the ending and the dancing? 6. The dark side of the play: Japan, the courts, power struggles, violence and death? The duke and his exercise of power? Oliver and his attack on his brother, the violence, burning the house? 7. The romance, light, the focus on the two women, the two heroes? The disguise and Rosalind as a man? Gender jokes? The pretence by Rosalind for Orlando, teasing him? The complications with Phoebe and her falling in love with Ganymede? 8. The court, the duke, benign, the women at the court, Touchstone and the humour, the joy, the music, the change, the attack, the violence, going into exile? The court in the countryside? The duke going hunting? Jaques and his comment and his distaste for hunting? The final reuniting of father and daughter? The joy at the wedding? 9. Orlando, his father and his reputation, the clashes with his brother, their initial arguments about the estate? Orlando and his skill in wrestling, the encounter with Rosalind? Love and infatuation? His victory, Oliver’s reaction? His escape, the discussions with old Adam, going into the forest with him? Their being hungry? Accosting the shepherd, settling in the country? Adam and the food? Meeting Rosalind, thinking she was Ganymede? The love letters on the trees? The playacting and his courtship of Rosalind with Ganymede? Seeing Rosalind in the river, not recognising her? The fight with the lion, Oliver rescuing him? Sending Oliver to communicate his love to Rosalind? 10. Oliver as evil, his clashes with his brother, alliance with the duke, burning the house, being commanded to search for his brother? Rescuing him from the lion? The reconciliation? Falling in love with Celia? 11. Rosalind and her character, love for her father, going into exile, the disguise, taking Touchstone with them, relationship with Celia? The encounter with the shepherd, with Phoebe and her beau? The complications of the relationships? 12. Silvius, the shepherd, his love for Phoebe, her rejection of him? 13. The usurping duke, finally alone in the court, repenting? Meditating in the forest? Jaques coming to stay with him? 14. Touchstone, the comic touches, his walking with Jaques? His infatuation with Audrey? The innuendo and comedy? 15. Jaques, the scholar, going into the forest, ‘All the world’s a stage,’ his discussions with Touchstone, his watching the priest, the idea for the wedding? His decision to withdraw, with the duke? 16. The happy ending, the marriage, the couples, love, song and joy – and the humorous touch with the epilogue and Bryce Dallas Howard talking to the screen, Kenneth Branagh saying ‘Cut’? 17. The quality of this Shakespearean screen experience?